“Where is the best place to buy a sewing machine?” you think to yourself as you look at the spot in your home where your new sewing machine will eventually sit. You have the perfect place picked out. There will be enough natural light coming in the windows during the daytime. For nighttime sewing, you have placed a couple of lamps around the sewing area. You’ve read The Best Sewing Machine for You and have put a lot of thought into the machine you want. You’ve even been online several times and found some sewing machines that meet your criteria. You’re just not sure if online is the best place to buy a sewing machine. Buying a sewing machine shouldn’t be done lightly. It shouldn’t be a spur of the moment purchase. You want the machine you get to be reliable and have the features you need for the type of projects you want to do. There are many brands and models of sewing machines ranging in price from under $100 to thousands of dollars. Almost everyone I know who sews has a definite opinion on what sewing machine is the best. Instead of recommending a specific sewing machine, I’ve shared places you can buy one along with positive and negative considerations for each. The pros and cons for where you can buy a sewing machine, along with your answers to The Best Sewing Machine for You, will set you up for a successful shopping experience. Note: You can search online “authorized dealers of sewing machines” followed by your city and state to find authorized dealers near you. Authorized dealers are experts on the brand(s) of sewing machines they sell and may carry parts and accessories on site. You usually can sew on machines to see how they feel and what they can do. Locations that specialize in sewing machines will often offer classes to help you learn about the machine after you make a purchase. Many authorized dealers will have pre-owned machines that are sold for less than a new machine. Customer service is more personalized and repairs may be offered on-site. Prices of sewing machines may be higher than other places. If they don’t offer in-store repair service, the machine will need to be sent off to be fixed. 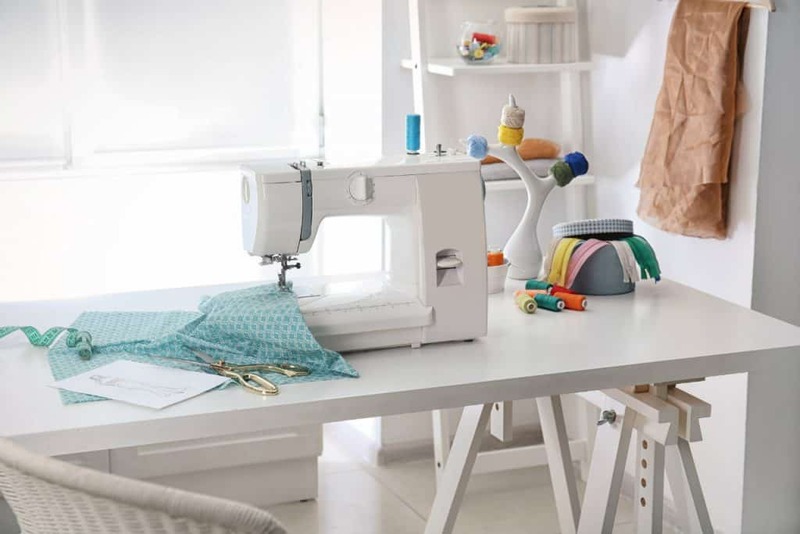 Technically, borrowing a sewing machine isn’t the same as buying one but it is a great way to try out different brands and models before you spend your money. You would have the opportunity to try out a sewing machine to see if you like a particular brand or model and be able to narrow your options on what to purchase. If you sew several items on the borrowed machine, you learn what features you like and maybe even begin to realize what features you would like to have on your future machine. When you borrow a machine from a friend or family member, they may not actually know what condition the machine is in. If it has not been used in a while there is the chance it could be running a little rough. It might need to be oiled or need some routine maintenance. You may find yourself paying to have the machine serviced before you use it. A sewing machine IS a machine. There is a chance something could happen while it is in your possession and it stops working correctly. Would you feel responsible and offer to pay for the repairs? Depending on how organized your friend or family member is, it may be hard for them to put their hands on the manual. (Note: You really want the sewing machine manual as you learn how to use the machine.) A plus side to this negative is manuals can be found online for almost any make or model. The machine might be missing some presser feet or other accessories. Replacement parts for some machines can be expensive and hard to find. When you start to look at retail stores you will find a variety of price points, brands, and models. As a result, you have the ability to compare different machines. After purchasing the machine, if for some reason it wasn’t quite what you expected, you should be able to return or exchange it depending on the store’s policy. If the retail store offers the option of shopping online, you can read customer reviews. 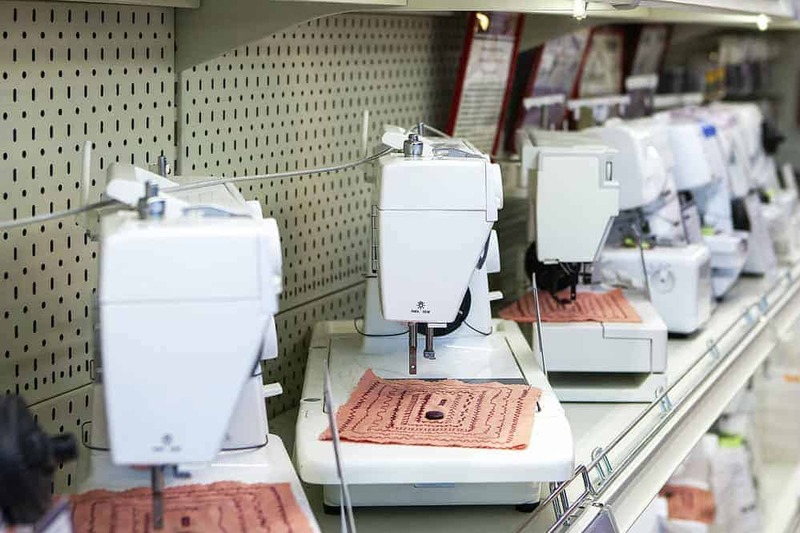 Unless one of the large retail stores has an authorized dealer located on the inside, there may not be anyone to talk to who is trained specifically on sewing machines. The sewing machines may all be in boxes. There might not be any on display for you to see or try out. The selection of machines will be abundant. You will be able to see multiple brands and models in all price ranges. You can read customer reviews. It is enlightening (and interesting) to read people’s opinions. The online store may have multiple pictures and/or videos that allow you to see some of the highlighted features. Some brands may even offer online classes and tutorials on how to set up and use the machine. Like brick-and-mortar stores, returning the machine may be an option if it doesn’t work out. The selection of machines will be abundant. You will be able to see multiple brands and models in all price ranges. Yes, this was a positive, too. BUT, all those choices may be overwhelming. Depending on the online store, shipping charges may apply. Shipping charges could apply, too, if you need to return it. If you are in the right place at the right time, you could find a deal on a previously-owned sewing machine. If you like vintage machines, you may find one in decent condition. Storytime: During a spur-of-the-moment stop at Goodwill, I found a vintage Singer in the original wooden cabinet for $25. I use it for a night stand, but every once in a while I open the cabinet and take out the machine. While it wouldn’t hurt the cabinet to be refinished, the sewing machine is beautiful! The exact condition of the sewing machine may be difficult to determine. It is highly possible someone removed parts before donating it. Accessories could be missing, including the foot pedal. Replacement parts for some machines can be expensive. Depending on the machine, it may be difficult to find replacement parts or missing accessories. Storytime: Driving through a neighborhood, I actually found a sewing machine on the sidewalk. It is a vintage machine with retro-looking knobs and a bright blue decorative plate. I couldn’t believe someone would set it on the sidewalk for anyone to take. I asked my husband if he would go knock on the door and make sure. Yep. They didn’t want it anymore. Now it is mine. It isn’t one I plan to use for sewing but it makes me smile when I look at it. The negatives for finding a previously owned machine in any of these places is the same as listed above in the Local Thrift Store section. Storytime: The fun vintage sewing machine I found on the sidewalk didn’t have the manual, any accessories, and the foot pedal looked like an electrical accident waiting to happen. The pedal would need to be refurbished or replaced before I could ever use this sewing machine. First, spend some time educating yourself and doing research before you buy a machine. Read The Best Sewing Machine for You to get your thought process going. Then, go to one or more authorized dealers. Talk to the people who are experts, ask questions, and test out the machines. Pay attention to how the fabric moves through the machine. Does it feed evenly? Once you gain knowledge and sew on some quality machines, you will have the confidence to search out previously-owned machines (if budget is important) and know what to look for and how to test drive them. Tip: In order to try out a machine before buying it, especially if it is pre-owned, you may need to bring a few supplies with you: thread, fabric scraps, machine needles, scissors, and bobbins. By doing your research, talking with authorized dealers, and taking a machine or two for a test drive before you start seriously shopping, you will better understand what you are shopping for and if the sewing machine you are looking at will meet your needs. Based on the positives and negatives of different types of places explained in this article, determine where you will be most comfortable making this important purchase. Then start shopping. When you find a sewing machine that fits your criteria, you will be confident the decision you make on whether or not to actually purchase it is based on well-thought-out analysis of a variety of different factors. You may be tempted to just skip the research, go online, and buy a sewing machine with good reviews. You might even end up with a great machine that runs smoothly and meets your needs. It’s worth the extra time to do the research. You will be in a position to make an educated decision and not a spur-of-the-moment purchase that could end in buyer’s remorse. You want to have a tingle in your tummy and a feeling of anticipation when you sit down to sew. 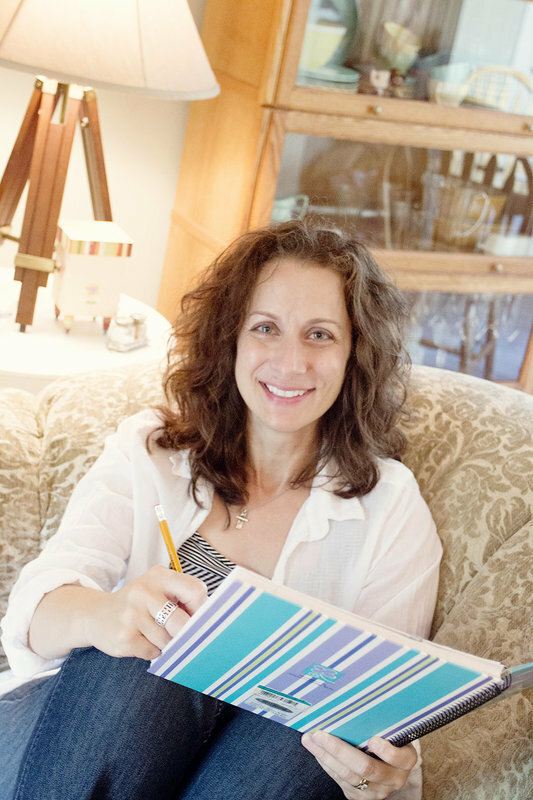 These feelings of excitement will be a direct result of knowing you did the research and bought the perfect sewing machine for you. Hint: While you are out looking for your sewing machine, you can pick up any of the essential sewing tools you don’t already own.